When I reviewed Stan Grant’s powerful Talking to My Country back in March of this year, I predicted that it could be a game-changer, but now I think that perhaps this Quarterly Essay might be the book that achieves more. In a coherently argued essay, what Grant is basically saying is that the image of indigenous poverty and disadvantage is only one part of the picture of indigenous life, and should not be the dominant one. The report “mapping the Indigenous Program and Funding Maze” reveals that 65 per cent of Indigenous people in Australia are employed and living lives, materially and socio-economically, like those of other Australians. This is three times more than the number living in urban and regional areas who are largely welfare-dependent (22 per cent). Another 70,000 people (13 per cent) are languishing in remote areas, also locked in cycles of dependence and welfare far from regular education or employment opportunities. While he acknowledges that he doesn’t speak for all indigenous people (who could?) what Grant is asserting is that identity politics isn’t helping. Assimilation is a dirty word, but being economically integrated into Australian society without losing cultural identity or denying Black history is how many Indigenous people are successfully living. I don’t want to misinterpret what Grant says. The essay is complex and sophisticated and some of what he says is, he acknowledges, contentious. Well, the QE is inexpensive and also readily available in libraries. Just get a copy and read it, yeah? Update 22/12/16: Jonathan Shaw has written a really good review of this essay at Me Fail? I Fly. Available from Fishpond: The Australian Dream: Blood, History and Becoming (Quarterly Essay) or better still, subscribe through the QE website. You do have to make a stand at social occasions sometimes I think, and it can be done nicely (says she in her polite middle-class way!) by just presenting one’s own point of view. I was at a coffee last week where a person made a point about well-off indigenous people taking advantage of grants/scholarships etc – which is I guess a generalisation in the opposite direction (i.e. it’s either all indigenous people are dysfunctional or all are rorting the system!). I argued my case that *maybe* some do get an advantage that they aren’t the main targets for but that isn’t an argument to throw out these systems established to provide opportunities. I have no idea whether I changed the person’s mind, but she was polite, and she listened and respected my views. Oh, and the other argument to that man besides his not generalising, is that those so-called dysfunctional people have not started in life from the same position he has – it’s easy for us to criticise, who’ve been fed clothed, educated within the culture to which we intrinsically belong. Will definitely read this Quarterly Essay. By the way, well done you for saying something to that racist man—it’s really awkward to speak up in social situations, because you embarrass the person you disagree with, and often make those around you feel uncomfortable. But, you’re right—silence condones. There are things I let pass even if I disagree, but not racism. I also draw the line at homophobia. I hate to admit it, but I have in the past sat silently and not spoken up, and later hated myself for compromising my integrity. I no longer do it, and I don’t care if I cause embarrassment or discomfort! Yes, I’ve done the same, kept quiet when I shouldn’t have. But not any more. At school we taught the kids in our anti-bullying program that bystanders had a responsibility to intervene if they witnessed bullying (racism, homophobia, teasing etc) or to get help from an adult if they were too scared to do it themselves. I won’t say we had a perfect school, but we had a lot less trouble in the yard when every bully knew that the crowd was not behind him. And what goes for kids goes for adults too. 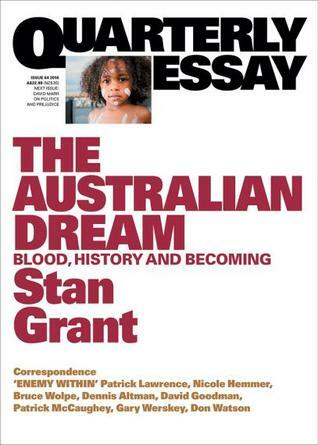 Thank you Lisa for sharing your review of Stan Grant’s new published essay. I have Grant’s book, Talking to My Country, on my personal reading list for the winter season. I hope that Grant’s book becomes available in the United States in the near future. I’m currently reading the book, Between the World and Me, by Ta’Nahesi Coates. In the Sydney Writers’ Festival podcast, it featured a reading and conversation with Grant. In the conversation segment of the program, he made reference to Coates’ book. I think both writers pose compelling ideas about the systemic forms of oppression that impacts the lives of many African American and Australian Aboriginal people. However, there are black people who are able to overcome such challenges, attain self-knowledge, and assert social and political agency in claiming spaces within society. Grant’s reference to the statistics and commentary on both the accomplishments received and the challenges still faced by Aboriginal people, it is important to place emphasize the importance on acknowledging and addressing issues of poverty, racism, sexism, classism, and labor and health disparities that stagnate some Aboriginal communities. Aboriginal historian Jackie Huggins also addresses many of the issues discussed by grant in her essay collection, Sister Girl. As an African American women educator, engaged reader, and citizen of the world, I would like to share the writings and activist efforts that Stan Grant, Ta’Nahesi Coates, Jackie Huggins, Alice Walker, Anita Heiss, Sam Watson, Tony Birch, Charles Blow, Alexis Wright, Larissa Behrendt, Terri Janke, Tara June Winch, Roxane Gay, Ali Cobby Eckermann, Marie Munkara and many other black writers around the world have undertaken in the fight for social justice within and outside of their respective communities. Well said, Sonia. I am pleased to say that I have read nearly all the writers you mention, and what I take from all of them is that we need to listen to a diversity of voices and to support initiatives that will make things better than they are. It is reading these writers that makes me confident that as a nation, we can do it. An excellent review (and discussion) of an important topic. I’ve also read Helen Razer’s review (https://dailyreview.com.au/helen-razer-stan-grants-australian-dream/53079/) and I think you both emphasize that it is important to recognise the validity of a diverse range of views. Grant’s highlighting of an emerging Indigenous middle class points to the possibility of a class based approach. ie. while there is the particular (and relatively small) problem of providing support for communities living on Country, we must also, urgently, address the problems, particularly for children, of the rural and urban long-term unemployed, without the sometimes overt racism of the Intervention. Thanks, Bill. Razer is good sometimes, especially when she’s not trying to be funny. He raises the issue of life in very remote communities, and while I don’t want to paraphrase him without the book to hand, I interpret what he says in the book overall as an issue of economics, not as in ‘this is what it’s costing the taxpayer’ but as in ‘this is what it’s costing the children’. He is scathing about children not participating in education because it means they don’t have choices. When I was at Melbourne University in the late 1950s and early 60s, I belonged to a group called ‘Abschol’ (Aboriginal Scholarships). We were basically a lot of idealistic white kids who thought something should be done for Aboriginal people (who were then not even citizens) and that the answer lay through education. Yes, looking back it was paternalistic but the idea behind it was sound and I still believe that education is the key (and employment of course, but they are intertwined.) What you quote from Grant’s essay is a salutary reminder of what so many Indigenous people have achieved against massive odds. Hello Carolyn, thank you for this contribution. I feel confident that Grant would agree with you, and I’m sure the recipients of those scholarships would too. Work done by people like you are behind those employment statistics that Grant quotes as indicators of success. From what we see now in the media (and I am mindful of the limitations of that) the problem now exists in communities that children of primary and secondary school age aren’t attending school regularly. Whatever the reasons for this, regular attendance has to be established, by adults who ‘know what’s good for the kids’. I know from my own experience teaching Aboriginal children here in Melbourne that the adult who should be responsible for attendance isn’t, for whatever reason, always able to make the necessary decisions. It’s not my place to judge but the outcomes were apparent. The child I taught came to school because he wanted to, and he got himself to school independent of any adult help. In two years with me he went from being able only to write his name to being able almost to keep up with his peer group. A transition program was put in place at the secondary school he went to, and if similar processes were put in place as his family moved around from place to place, he will have been ok. He was a smart, determined kid. But his sibling in another class did not want to come to school, and wasn’t made to attend. From what we saw of her, we thought she was smart too, but she remained illiterate.